The Valle d’Aosta, Italy’s Beautiful Secret – GARGANTUAN WINE. I can see myself living here for a while. The Valle d’Aosta is the fascinating Alpine junction between France, Switzerland, and Italy. In the extreme northwest of Italy, Valdostano denizens typically speak both French and Italian, their accents a mind-bending blend of Southern French drawl and classic bouncy, sing-song Italian. Contrary to popular belief, the Romans may not have been first to bring viticulture to the region, with a possible earlier arrival alluded to by locals citing a historian named Guillemot who discovered proof of native vines ca. 2000 or 3000 BC1. 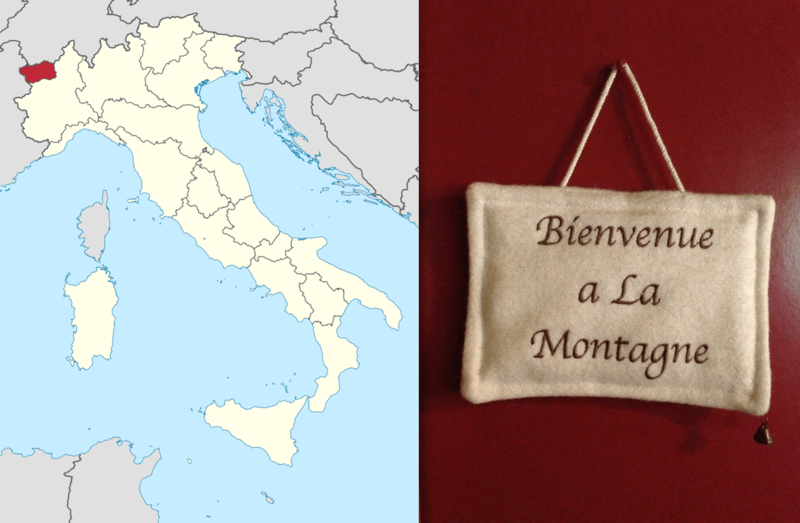 At different moments much later in history, the House of Savoy possessed every greatest wine region in the world: Burgundy, Piedmont, and the Valle d’Aosta (which served as their hunting grounds). Oh, to have been a Duke of Savoy. The Valle d’Aosta is quite dry, and you’ll see evidence of irrigation all over while driving the freeways — giant sprinklers working to keep vines alive. Massive streaks of green granite are visible from along the highways that curl through these glacial valleys; roche-mères2 that sit above quarries and seem to bleed crumbly, powdered rock, like green scars cut into the side of a mountain. Both blue and green granite are common terroir components throughout the Valle d’Aosta. These are ridiculously shallow, sandy glacial soils, where the ocean never reached nor deposited calcium-based limestone minerals (as in neighboring Gattinara, or, say, Chablis). I’d like to explore this region through two different producers: one is a co-op, integral to the region’s success, and the other an iconic, independent producer. Each is emblematic of the region in a different way. Before the phylloxera louse, thousands of hectares were under vine in the Valle d’Aosta. After World War I and World War II, as the work force was lost, only a few vines kept alongside grazing cows for personal consumption remained, and field blends were the rule. Thankfully, over the last 30-40 years, co-ops have popped up all over the Valle d’Aosta and allow farmers to continue without the financial infrastructure for bottling and cellaring. They’re responsible for the gradual restoration of vineyards which previously lie fallow. Now, 350 ha are under vine (twice the area of tiny Valtellina), and often at around 2,800 feet elevation, they’re some of the highest in Europe. This clos houses some of the vines which go into my beloved wine. An Alpine paradise. The La Kiuva co-op produced its first wine in 1979. The co-op buys enough grapes to crank out 70-100,000 bottles annually. Interestingly, the traditional pergola vine training method (which was so cherished for Picotendro) is still visible in certain places, and offered the ability to farm over rocks with higher yield and higher acidity, but unfortunately the wood and labor for upkeep are cost prohibitive and have rendered it all but obsolete over the last 25 years. Forever struggling to improve, since 2008 the La Kiuva co-op has employed a consultant who visits the co-op’s vines biweeky and offers advice to growers in order to avoid usage of chemical pesticides. They’ve also relied on indigenous yeasts for fermentation since 2009. 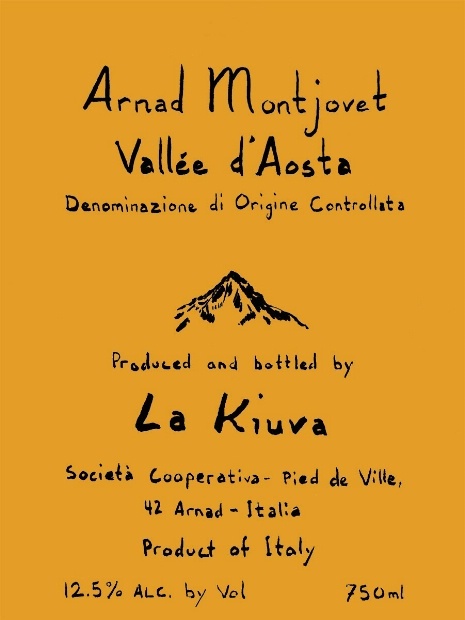 2012 La Kiuva Arnad-Montjovet Vallée d’Aosta DOC, Italy: At a piddily $20, this is a QPR wrecking ball. Since my first taste of the mythic 2007, this co-op has changed winemakers, with a new winemaker taking charge in 2010. Such is the price of falling in love with co-op wines; at a moment’s notice, the wine changes dramatically. One thing is consistent: Arnad-Montjovet red blends must be at least 70% Picotendro (=Nebbiolo). The rest may be Dolcetto, Freisa, Neyret, Pinot Noir, or Vien de Nus. Since 1544, Picotendro has been the official local name for Nebbiolo. In addition to Picotendro, the La Kiuva Arnad-Montjovet rouge has other fun, weird, classic red Valle d’Aosta varietals blended in: Fumin, Gros Vien, Neyret, Cornalin. My sense is that once you’ve got your 70%, you can add whatever you please of the region’s red varieties. The La Kiuva Arnad-Montjovet red is stunningly feral and alluring, and it immediatley disarms you with its lightness and aromatic density. It has a smokey, earthy nose, with a sweetness that’s somehow palpable as well, but it lands on the palate with a far lighter weight than expected. Rustic but light; limpid and classy. A spicy palette of aromas that evokes sweet winter. It opens into an unmistakeable “strawberries in a freshly-soiled ashtray” sort of affair. It’s just lovely, and upon discovering the 2007 I consumed around two cases in only three months (that’s what I mean when I say gargantuan). It really tastes as though Petit Rouge — yet another fabulous, undervalued grape from the Valle d’Aosta that we’ll explore in our next article — is in this wine, but allegedly it doesn’t figure in the blend; it’s mostly Nebbiolo. This is a wine that I enjoy pairing with gently seared veal fillets with plenty of brown butter, sage, and lemon zest, and something like a small side portion of pasta or even polenta alongside mushrooms if it’s deathly cold outside. The puckering brightness cuts through each of the taste elements, and just warms your soul in the dead of winter. Given its light-footed character, its subtle tannins, and low alcohol (12.5% reported), it’s ultimately so versatile that you can drink it in any season or during any course of a meal — the co-op actually recommends it with appetizers. 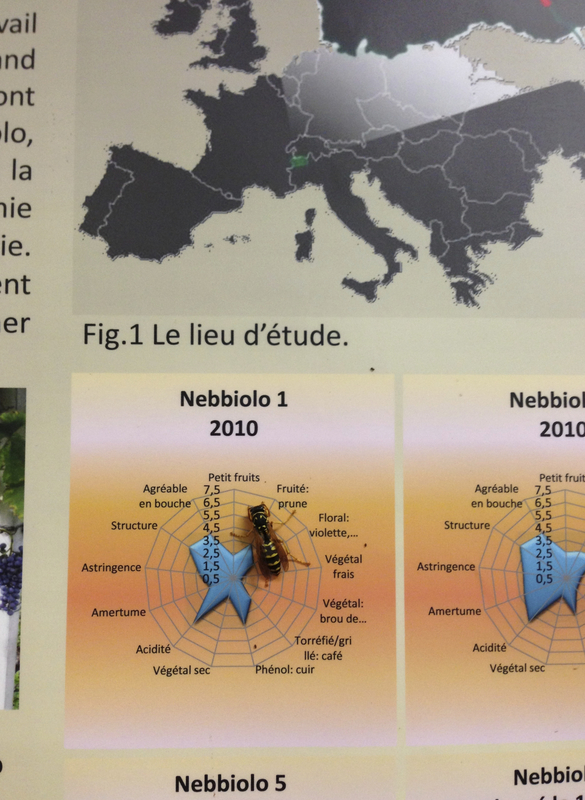 A wasp takes a closer look at Arnad Montjovet’s Nebbiolo aromas. The photo above is from a research poster displayed in the La Kiuva cellar for a study commissioned in 2010 to examine the effects of harvest date on grape quality3. It’s interesting to note the sensorial analysis vectors they’ve chosen: one vague criteria for how alluring the taste and texture are, then: tiny fruits, prune, violets, fresh vegetables, vegetable husks, grilled/roasted coffee, leather (=phenol, an aroma proper to any Nebbiolo), dry vegetables, acidity, bitterness, astringency, and structure. The wine spends two to three months in steel containers, then one to three in wooden barrels, and finally waits six months in bottle to settle down before going to its eventual market: either the USA (70%) or Italy (30%). Don’t expect anyone else to know anything about these wines; they simply don’t exist there. The 2013 is the current release of this wine, and I haven’t sampled it yet. The 2012 is still for sale in a number of shops (my shop sold out long ago). The co-op seems to get the wine right about once every 2 or 3 years: 2007 was mythic, 2010 was also great, as is the 2012. The other vintages weren’t to my liking … a fickle lover of a wine. This vintage variation is very much a part of the Valle d’Aosta experience: a land of extreme contrasts, of extreme highs and lows; and this phenomenon is similar with many other winemakers’ efforts. Whether this is attributable to vintage variation, changes in the cellar, or some mixture of the two remains unclear to me. All the same, I’m still eager to sample the 2013, and hope the pattern can be broken. In my next article, we’ll visit Vincent Grosjean, an independent grower whose wines are among my favorites in the Valle d’Aosta. It is a lovley place in Italy and we do love it for all its good wine & food.